Why Do You Swell After Workout? If you have ever begun a new weight-training program and then found it difficult to walk down stairs for the following few days, you are familiar with the uncomfortable side effects of muscle strengthening. You might develop swollen muscles after weight training. You might also find that your strength and range of motion have decreased, and you feel stiffness and discomfort. Exercising causes temporary inflammation and swelling as muscles fibers are broken down and rebuilt to increase strength. When a muscle lifts loads that it is unaccustomed to, the stress causes tiny tears in its fibers. These tears are a natural part of building stronger muscles because when the damage is repaired, the muscle fibers are rebuilt stronger than before. Almost immediately after exercise, white blood cells rush into the muscle to clear up the debris from the muscle damage, producing prostaglandins as a byproduct. Prostaglandins is a hormone-like substance that causes pain and swelling. Along with white blood cells, fluids carrying other nutrients and enzymes rush into the muscle to support the rebuilding process. The extra fluids packed into the muscle also cause swelling after a workout. A muscle contraction has two parts: the concentric or "positive" phase (i.e., the "up" phase of a biceps curl) and the eccentric or "negative" phase (i.e., the "down" phase of a biceps curl). Multiple studies have demonstrated that eccentric contractions cause the most muscle damage, pain and swelling; the muscle must lengthen as it contracts. Although weight training usually causes muscle soreness, the cumulative stress of eccentric contractions in weight-bearing endurance activities, such as running a marathon, can also cause muscle damage and swelling. Swelling after exercise is a component of a condition called delayed-onset muscle soreness, or DOMS. In addition to swelling and soreness, DOMS can cause joint stiffness and temporary weakness in the affected muscles. Symptoms of DOMS typically set in between 24 to 72 hours after your workout and subside after a few days. Some athletes use anti-inflammatory drugs, massage or active recovery to relieve post-exercise muscle swelling and soreness. Anti-inflammatories may reduce swelling after a workout, but check with your doctor before taking any medications. A study published in 2018 by Frontiers in Physiology found that massage helped reduce swelling caused by DOMS, even if it wasn't performed until several days after the workout. Compression garments, immersion in cold water and contrast baths alternating between warm and cold water also had a positive effect on DOMS. Not all pain causes gain. Athletes must learn to tell the difference between swelling associated with recovery and swelling caused by injury. Acute injury causes sharp pain during exercise and immediate swelling. Swelling from injury is usually localized around a bone or joint. Chronic injuries may not cause appreciable swelling, but pain will be greater during exercise than in the following days. 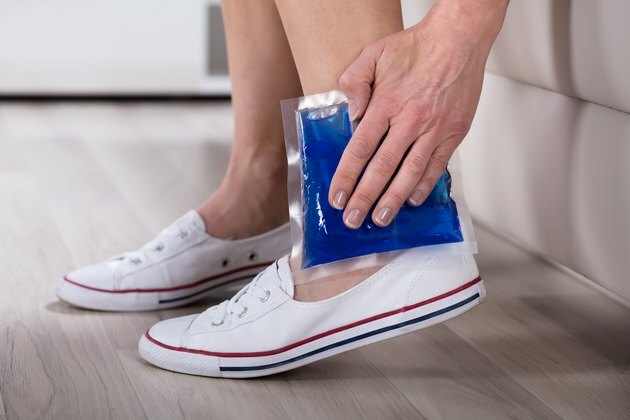 If you suspect injury, seek medical advice and use rest, ice, compression and elevation (RICE) to relieve the swelling.